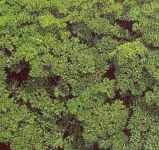 There are several species of Petroselinium, but the most well known are Garden Parsley (Petroselinium crispum) and Hamburg Parsley (Petroselinium crispum tuberosum). Garden Parsley is a perennial herb, and is available as either Curled (or Moss curled parsley) or Plain leafed. 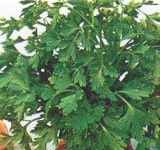 Curled parsley has fine, ruffled leaves on a compact plant, and Plain leafed parsley has larger, flat leaves. Both types are high in vitamin C, amino acids, aspartic, and glutamine. This species is a commonly used cooking herb, but is actually a multi-tasking plant. The leaves are used to flavor foods and are used to treat kidney stones, jaundice, cystitis, rheumatism, and to rid the body of toxins. A poutice made of leaves can be used to soothe insect bites or toothache. The roots and seeds are used as a wash to treat dandruff, as an expectorant, and to stimulate menstrual flow. In the garden, parsley makes a good companion plant as it repels insects and it can be rubbed on the skin to repel mosquitos. This is a very strong tasting parsley when used as a garnish. The roots are much more generally used and are prepared like parsnips - grated into salads or cooked and eaten. Medicinally, it is used as the species above, being prized as a cleansing herb, ridding the body of toxins, however, since it is used to expel kidney stones and to stimulate menstrual flow, it is best for pregnant women and those suffering from kidney disease not to consume large quantities of this herb. All forms of parsley are easy to grow, and Petroselinium crispum can be grown in a pot on a sunny window sill for winter use. They are considered perennial plants, achieve a height of about 18in. and prefer a well drained site in full sun.